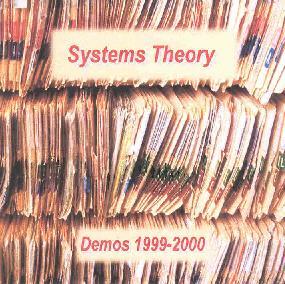 Systems Theory - "Demos 1999-2000"
The core of Systems Theory is the two-man team of Gregory Amov on Violin, viola, mandolin, guitar, bass, keyboards, and percussion, and Steven Davies-Morris on keyboards, sequencers, samplers, percussion, drums, guitar, bass, loop programming, instrument processing and various other treatments and vocals. I have long beem aware of Davies-Morris as a frequent poster to the rec.music.progressive internet newsgroup, but was surprised by the quality of these "demos" which represent the culmination of a collaboration that began as far back as 1977. Joining Amov and Davies-Morris are Diane Amov on flute, recording, pipes, and whistles, and Mike Dickson on mellotron. The first line of the Systems Theory web site describes the band as, "Progressive world music with tons of technology-derived spaciness and heavy rock derived attitude. Ambient without sending you to valium noddy-land. Proggy without slavishly imitating yesterday's symphonic giants." An obvious struggle to describe the territory they cover, and after several listens I'm sympathetic to the challenge. Systems Theory's music is rooted in classic progressive fusion rock. Despite the presence of "real" instruments the music sounds primarily electronic and displays clear space rock and experimental influences throughout. On "Under Oriental Skies" the motif is most definitely oriental. But while I hear a smidgen of traditional oriental sounds at the beginning and end, the majority of the tune is a fairly freaky electronic take on a prog rock styled oriental theme. Some of the synth lines have a bit of a Steve Hackett guitar sound but that's a loose analogy as this has a melodic yet experimental bent that would never be heard on a Hackett tune. "Breakdance In Hell" begins in a more overtly spacey atmosphere. The mellotron gives the music the expected classic symphonic sound, yet it's simply the backdrop for a multitude of electro percussive beats, trippy synth noodlings, dancey techno and various other electronic patterns. Flute and sax bits give it a jazzy feel but these are just a single piece of what feels like an electronic progressive big band. The headphones treatment revealed an impressively busy, yet well constructed symphony of progressive rock, trippy jazz, and space rock. A little something for everyone. "Where Titans Sleep" is still spacey, but more electronic prog rock oriented. The music kept me on my toes and at attention throughout, moving non-stop through a succession of themes that veer off in seemingly countless directions, and includes lots of cool oddball sounds popping up intermittently. Amov's violin fires off rapid little dissonant bits near the end, and the song ends on a part electro psychedelic, part industrial, part classic prog rock note. Lots of influences here, but coherence reigns to produce some fairly adventurous instrumental progressive space fusion. Rounding out the set is "Strange Obsession" which is similar to "Where Titans Sleep", being a somewhat jazzy progressive rock number. And "The Boy Who Gazed At Stars" seems to fuse the gamut of the band's influences, from spacey electro experimentations to more melodic and goal-oriented progressive constructions. In summary, Systems Theory would appeal to fans of complex but melodic instrumental progressive rock who also dig space and electronic influences. If these are demos, I'll be interested in hearing what Systems Theory considers the real thing. For more information you can visit Systems Theory at their web site.